Dating apps are evolving and becoming more and more engaging. When dating apps started to be popular you could just browse and find your soulmate, send messages and chats. Remember “You got email” movie – well it was the same princip. 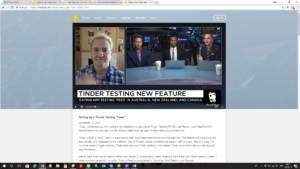 What is all about listen here where Barrett PR CEO Jeff Barrett, and Tribe.Fit CMO Murray Newlands, discuss on Cheddar.com how this feature might stack up against other dating apps in the field.